Line’s apparent $13 billion valuation sends a strong signal about chat app exuberance. The Japanese mobile messaging app’s quarterly revenue jumped 26 percent from the previous three months, its parent company reported on July 31. That pushes up valuation expectations ahead of its planned initial public offering. Yet Line’s valuation hangs on the assumption that new overseas users will spend like those back home. That seems like wishful thinking. Line’s South Korean parent, web company Naver, had a market capitalisation of $25 billion based on the closing share price on July 30, according to Eikon. Assume its non-Line revenue grows 10 percent year on year, and Naver’s web portal and search engine could potentially generate 2 trillion won ($2 billion) in revenue by the end of 2014. Apply an earnings margin of 30 percent, comparable to peer Yahoo Japan’s 33 percent, and on the same valuation multiple of earnings as the Japanese search engine trades at, Naver could be worth $12 billion without Line. That leaves $13 billion of value accruing to its crown jewel. At first glance that looks like a bargain compared to the $19 billion Facebook paid for rival messaging app WhatsApp in February. Line’s user base will reach 580 million by the end of the year, and 273 million of those users check in every month, BNP Paribas estimates. That implies a value of $48 per active user, where WhatsApp changed hands for $40. That’s not unduly high given that Line is successfully charging for added extras. It made 18 billion yen ($175 million) in just three months by selling virtual “stickers” and games, a 26 percent increase on the previous three months. Yet Line’s $13 billion value rests on the thin assumption that new overseas users will spend like those back home. The app gained 10 million users in India within three months of entering the market last year. Southeast Asia and South America are in the company’s sights too. It’s highly unlikely those markets will generate the same kind of returns from Line aficionados as wealthy, leisure-rich Japan. If expansion comes at a cost of declining revenue per user, Line’s value already looks close to the limit. The context news accompanying this article has been corrected to state that Line Corp’s revenue increased by 17.5 percent in the second quarter, while revenue from the Line app increased 26 percent. 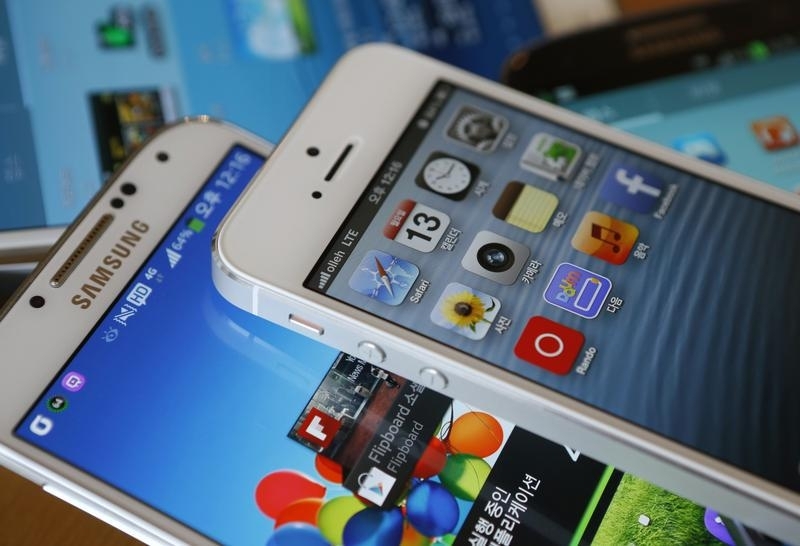 Apple's iPhone 5 (top) and Samsung Electronics' Galaxy S4 are seen in this picture illustration taken in Seoul May 13, 2013. Naver, a South Korean web portal and search company, reported revenue of 698 billion won ($678 million) for the second quarter of 2014, a 22 percent increase from the same period last year. Naver’s Japanese subsidiary, Line Corp, which operates the Line mobile messaging app, reported consolidated revenue of 21.2 billion yen ($206 million) in the second quarter, a 17.5 percent increase from the previous quarter. Naver said that revenue from the core Line app increased by 26 percent. Line Corp applied for an initial public offering at the Tokyo Stock Exchange, Reuters reported on July 15. Line is valued at over $9.9 billion, according to sources cited by Reuters.